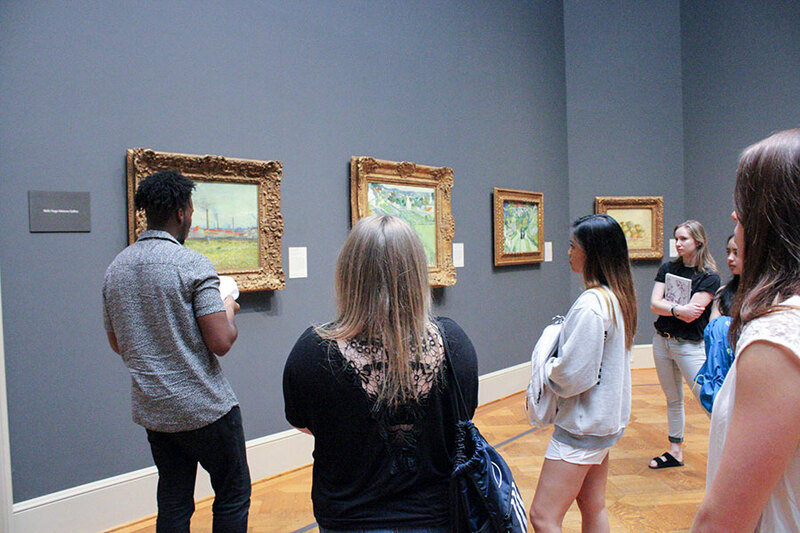 An art history class discusses Van Gogh's work on a visit to the Saint Louis Art Museum. The College is expanding programs in the 2018–2019 academic year to better serve evolving academic interests and prepare students for meaningful careers in a variety of fields. The Art and Art History Department has long offered an art history minor, and some students have designed an individualized art history major. But now students will have the option of majoring in art history without having to design their own program. In courses ranging from ancient art to the Italian Renaissance to 20th-century architecture, art history students investigate the historical and sociopolitical contexts that have shaped artistic expression through the ages and across the globe. “Art history does more than illustrate history—it increases visual literacy and generates research of profound depth,” says art history professor Dr. Margaret D’Evelyn. Students take classes in the recently renovated Voney Art Center and also enjoy experiential learning opportunities that get them out of the classroom. For example, they may participate in an on-campus archeological dig or travel to New York City, and they all make good use of the outstanding collection at the Saint Louis Art Museum. In addition, study abroad programs to England, Malta, Greece, and Italy are of special interest to art and art history students. The valuable research and writing skills gained in the major prepare students for fulfilling careers in museum work, the art and design market, architecture, historic preservation, publishing, cultural property law, and a variety of other fields. Principia’s sustainability minor has long supported students’ interest in seeking solutions to some of the world’s most pressing challenges, including climate change, renewable energy, and equitable global development. Starting this fall, students can further their study by pursuing a major in sustainability. With a focus on place-based study and the integration of knowledge across disciplines, the major is interwoven with Principia’s liberal arts education and must be paired with a major in a second discipline. “The program is designed to prepare the next generation of thought leaders as they seek solutions to today’s resource needs while conserving for future generations,” says Dr. Karen Eckert, chair of the Sustainability Department and director of Principia’s Center for Sustainability, which actively supports the major. Sustainability students also have ample opportunity to engage with professionals in the field by regularly attending conferences and completing a wide range of internships. The minor will open new areas of inquiry, exploring a range of topics that encompass the sports industry, including gender, class, race, national pride, and politics. Principia’s sport studies minor places particular emphasis on ethics and growth in character. The minor will pair well with a variety of majors, and graduates will be well-prepared for internships and career opportunities in coaching, business, governmental and non-governmental organizations, and more.